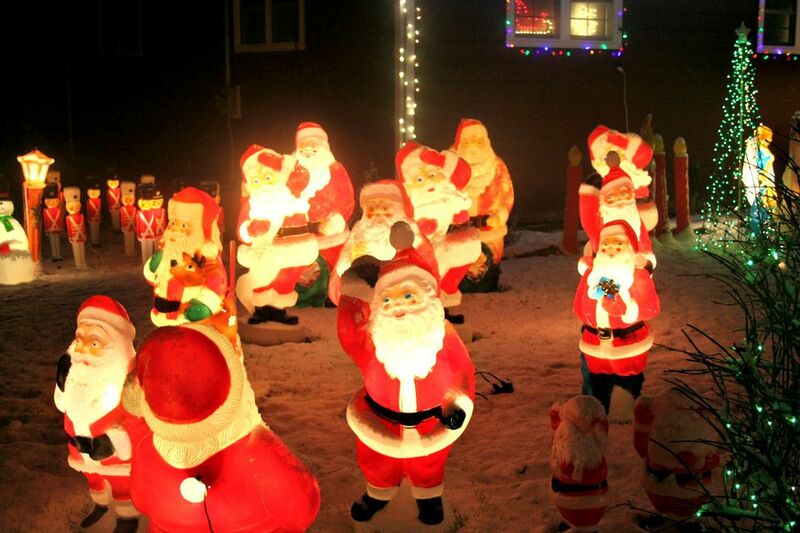 Before there were inflatable holiday decorations, lawns and porches were adorned with plastic lighted figurines: Santas, snowmen, reindeer, elves, candles, and just about any other Christmas character you can imagine. These wonders of plastic are known as blow molds, for the blow-mold-injection manufacturing technique that became popular in the 1930s. Familiar with the pink flamingo? It was invented by Don Featherstone for Union Products in 1958 and is probably the queen of all blow mold characters. Many blow molds have become quite collectible, while others continue to be manufactured or are being reproduced. Santa has reached into his magic bag to find new or reproduction blow mold Christmas decorations. Turn it on! And check out some fabulous blow molds—both old and new—from coast-to-coast! 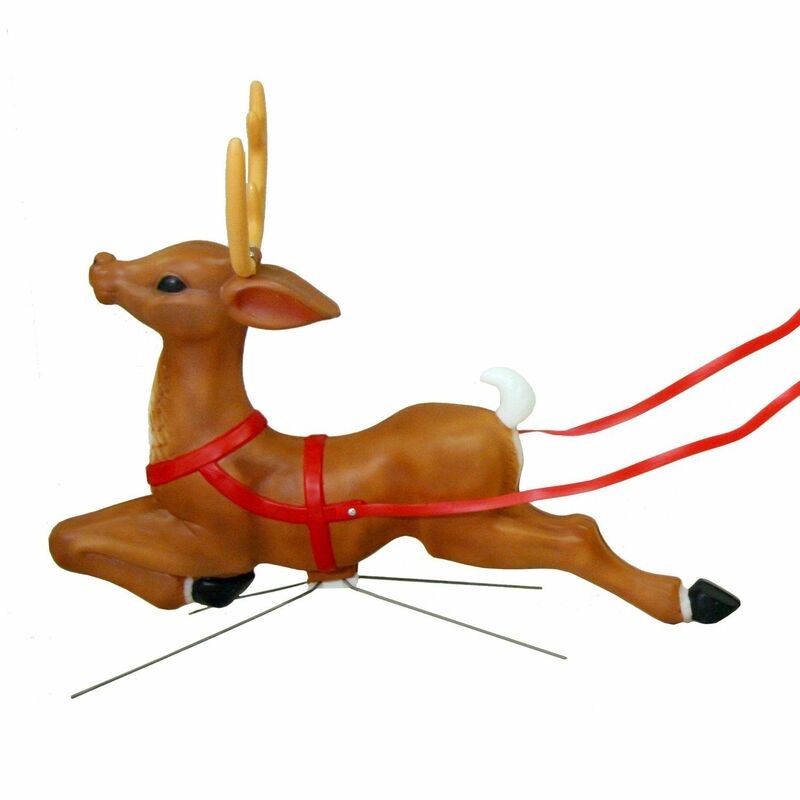 Add one or more to the Santa with sleigh and reindeer to create a team that can glide across your lawn or roof. While intended to be part of a blow mold Nativity scene for your lawn, this gold-toned resting camel could easily be at home next to your other blow mold figurines. While the one-humped Arabian ungulate is described on other sites as "life-sized," it measures just under 30 inches across—not sure what scale we're talking about here, but, who cares? Resting blow mold camel comes equipped with its own light cord and socket. The manufacturer recommends an "A"-size bulb for maximum light with minimal electric usage. Made of durable, weather-resistant polyresin, this highly sought-after Santa with reindeer is about 3 feet tall and nearly 6 feet long. The prancing reindeer lights up with a C7 bulb and is connected with a 3-foot power cord (bulb included). Santa lights up with a 4-foot cord, but you'll have to buy his bulb. Add more reindeer each year to create an old-fashioned scene across your porch or on your roof. A grouping of plastic Christmas carolers attired in old-fashioned garments will be a nice addition to your blow mold decorations, especially if you pipe in some holiday-caroling tunes. The blow molds include a boy and girl who stand 30 inches high. Another suggestion— get the blow-mold lamp post for a complete retro holiday scene. If this isn't a replica of one of General Foam's vintage blow mold Santa decorations, it sure looks like one. Santa Claus is posed while waving and goes pretty much anywhere—just not behind a giant inflatable Christmas decoration. Union Products is one of the pioneers of blow-mold plastic lawn figurines. They may have never thrown out the mold for this charming penguin, which stands nearly 2 feet tall. Get several, and create a colony of penguins on your holiday lawn. Some folks allow ​Plastic Penguin to roam their yard year 'round, even near the swimming pool in August. Like Santa, this plastic Blow Mold Snowman from Union Products is painted and stands a stately 40 inches tall. Jolly snowman takes a C7 bulb to get that inner glow, and light up your porch or yard for the holidays. Place him (or her) across from Santa for a symmetrical entryway or to light up your holiday porch or snow scene. General Foam Plastics had Babes in Toyland in mind when creating this erect-postured 32-inch toy soldier sporting a faux version of a black bearskin military hat. Like his other blow mold tribe, soldier boy is equipped to plug in and illuminate your porch or yard. If only gingerbread people could be real! ​A newer design, this plus-sized cookie lights up your outdoor display and adds whimsy to the cast of characters that inhabit your yard for the holidays. This illuminated character is made by United Solutions. The irony—a giant version of those energy-consuming vintage Christmas bulbs is now powered by a battery-operated LED (included)! General Foam Plastics appeals to its retro-loving collectors with a weather-resistant polyresin 28-inch-tall C7 or C9 style bulb that comes in red, blue, or yellow and includes two cut holes for hanging.